While women continue to gain ground in leadership positions across sectors from politics to business, in reality, women still occupy far fewer leadership positions than men in countries around the world. In 2014, for example, women occupied only 4.6% of Fortune 500 CEO positions. Research on the subject of gender and leadership consistently shows that despite the fact that women now often constitute half or more than half the workforce in many sectors, they continue to lag behind men in leadership positions. Indeed, the higher up the ladder one goes, the more scarce women become, with female CEOs and board members constituting only a small fraction of positions. While many traditional advancement barriers have been removed (e.g., lack of access to higher education), attitudes about women and their leadership potential have proven much more resistant to change. Somewhat surprisingly, however, the increasingly valued attribute of emotional intelligence or EQ may be part of the problem. Despite the growing recognition of and appreciation for EQ in the workplace, women often continue to be perceived as lacking the required skills needed to assume leadership roles because they are perceived as having higher EQ levels than their male counterparts. In other words, while EQ is now typically considered a highly desirable trait in male leaders, for many women leaders, the perception that they have high EQs conversely appears to work against them, since it is perceived as a potential weakness not strength. 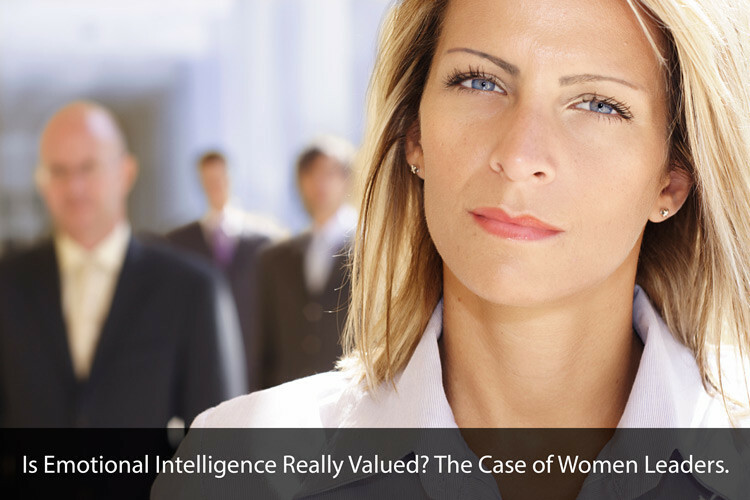 A 2005 article by Barbara Rheinhold in the Journal of Organizational Excellence emphasizes that while companies now spend millions of dollars training male executives to increase their emotional intelligence, EQ training has yet to impact the visibility of women in leadership positions. In fact, Rheinhold concludes that while it is now commonplace for companies to recognize people skills and EQ as desirable and necessary traits for middle managers, the same does not hold true for leaders. In other words, women middle managers who are highly valued in part because of their EQ are, in some instances, relegated to middle management positions because EQ is all too often seen as divorced from leadership capacities. The assumption is that women with highly developed levels of EQ are less likely to have highly developed capacities for reason and logic, which is not necessarily the case. EQ and IQ, after all, can and often do co-exist. In contrast to the Rheinhold study, a more recent study by Duke University researcher Ashleigh Shelby Rosette suggests that the situation may be at least somewhat more hopeful. Rosette carried out two experiments to evaluate whether women are ever perceived as both competent and relational and to further assess how these factors impact women leaders. In her first experiment, a group of 323 students read fictional newspaper clippings about male and female CEOs that pointed to their competencies and relational characteristics. Rosette discovered that in fact students ranked female CEOs as both more competent and relational than their male counterparts. In the second experiment, more than 100 students reviewed fictional job descriptions and performance summaries and then evaluated the male and female employees, as they did in the first experiment. Although both male and female executives and managers were described as successful, students perceived the women more favorably than the men when evaluating employees in top-level positions. As Rosette reported in a Journal of Applied Psychology article, it appears as if women’s relational skills or EQ works against them but only until they ascend into leadership positions. If they can break through the glass ceiling, their perceived EQ works in their favor not against them. Whether the perception that women have highly developed EQs prevents them from assuming leadership positions or poses challenges once they assume leadership roles, however, there is ample reason to conclude that EQ is still not gender neutral. As a result, EQ training in the workplace needs to address both the potential of emotional intelligence and how hardwired assumptions about gender and emotions continue to structure organizations in the 21st century.